James Rampley (1803 Harford County, Maryland-1884 Hancock County, Illinois) and wife Elizabeth Chaney(1804 Bedford County, Pennsylvania–1883 Hancock County, Illinois)-3 members in each. Hinrich Jacobs Fecht (1823 Wiesens, Ostfriesland, Germany-1912 Hancock County, Illinois) and second wife Maria Gerdes Wilken (Bruns) Fecht (1831 Wiesens- before 1877 Hancock County)–was 4 for Hinrich–now up to 6 and 7 for Maria. Christianna (DeMoss) Rampley (born in the early 1770s probably in Harford County, Maryland–19 members of this circle–6 more than before. Augusta Newman (died 1861 White County, Indiana)–8 members of the circle. Johann Luken Jurgens Ehmen Goldenstein (born 1814 Wrisse, Ostfriesland, Germany and his wife Tjade Anna Focken (Tammen) Goldenstein (born 1824 Buhren, Ostfriesland, Germany)–still 3 in both circles. Hinrich Janssen Ufkes (born 1797 Ostfriesland, Germany) and the circle for his wife Trientje Eilts (Post) Ufkes (born 1803 Wiesens, Ostfriesland, Germany). There are still 9 in Hinrich’s circle (was 8) and still 8 in Trientje’s circle (was 7). Riley Rampley (born 1835 Coshocton County, Ohio) and the circle for his wife Nancy Jane (Newman) Rampley (born 1846 Rush County, Indiana)–3 in both circles. Johann Friederichs Hinrichs Ufkes (born 1838 Wiesens, Ostfriesland, Germany) and the circle for his wife Noentje Lena (Grass) Ufkes (born 1848 Backemoor, Ostfriesland, Germany)–Johann’s circle as 4 and Noentje’s circle has 3. The number in Hinrich Fecht’s circle has increased to 6 and the others remain the same. For what it is worth, I’ve been removed from every circle based upon my great-grandmother Neill’s ancestry (The Rampleys and the Newmans). I’m out of the Johann and Noentje (Grass) Ufkes circle, but still in the one for his parents (Hinrich and Trientje [Post] Ufkes). I had been using the circle information to help sort my results. I’m now suggesting users save their circle information when they have it–in case it goes away. One gets in circles due to the results of the DNA test and having a tree attached to the DNA results. The trees are the key to connecting you to the circle. If one circle member makes their tree private or chooses to connect another tree to their results–your circle will change. Check out Michael’s available DNA webinars here. ← A Belleville, Illinois, Death Recorded in St. Louis, Missouri? Thank u so much for this information. I’m still learning this who new who’s in my family DNA process. People please bear with me if you are in my circles and you haven’t been included as I am still not sure how to go about including u as I have over 600 pages apparently to go through to find u.
Ancestry automatically places people into circles based on matching criteria. You don’t have any control over who is added or not. Me, too! I was in a small circle of a 4x great grandfather or great uncle. I’m not sure where he fits in. I was given the suggestion that I was in his circle and share some version of DNA with his other decadents. But, I really don’t believe this man is a direct ancestor. I made some changes to my tree, changing his location and then the circle group disappeared. There were about 3 groups of people in that DNA Circle. When I put the positions back to their original placement, it’s not come back at all. Frustrating! But, it also may have not been just me that made changes and that explains why the group disappeared. And, there are several suggested DNA circles that I just cannot figure out how the suggested ancestor belongs in my tree at all. That’s interesting. I’m not in any circles of an individual who is not an ancestor. Changes to individual trees can change the circles in which one appears. I thought that one only got in circles when that person was actually an ancestor in your tree. I’ll have to keep tabs on my circles to see if I appear in one for a aunt/uncle or other non-direct ancestor. Circles rely a great deal on the tree data entered. 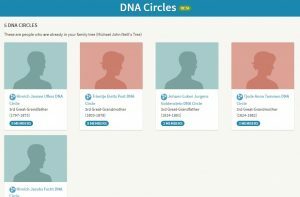 I’ve had circles reflecting a weak or missing later status for a variety of reasons: more than one marriage thus weakening the dna ‘count’; variations of years and place names; name variations, or just plain got the ancestor wrong. It should be noted that multiple marriages will mess with the predicted level of relationship as well as Circles. i.e. My half siblings are reflected as Close Family rather than Siblings. A 3rd Great Grandfather was married 3 times and there are matches with children from all marriages with the predicted relationships being slightly off for some. Predicting ancestors based on matches to other’s circle has not proven productive to me. 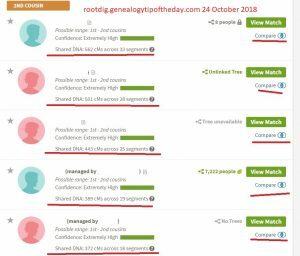 They usually predict an ancestor fairly early when I’ve already got the positions filled with someone else and verified with documentation and dna matches. I do keep a database of the matches that have previously come up, especially as none are reflected now. I keep hoping that those family trees will come up with an ancestor father back but so far it hasn’t panned out. I’ve also noticed that it takes forever for Ancestry to do the ‘scrub’ that updates circles and other information. Its very apparent that dna matches are updated when circles are not. So extreme patience is required for circles that are a bit like twinky lights that appear and disappear. I keep a database of all matches, with the url link, and update frequently. Many times a match url link will disappear with the notation ‘Sorry, this match doesn’t exist.’. I’m always happier when I have a match with a collateral line because it strengthens the actual bond to the direct ancestor. However, matches with the direct ancestor are still important, too. I’m assuming your tree is tied to your DNA results? At least you are in a circle. I’m still not in any and I have my tree up. I look at the circles more out of curiosity than anything else, to be perfectly honest. Since they are tied to tree results (at least for now), they rarely are people that I’m not already somewhat aware of.